You want the highest score you can achieve on the TOEFL, and you know that you want to focus on the writing section because small changes can make a significant difference in terms of your score. You are improving your vocabulary by taking the words you are memorizing to increase your understanding of reading passages and utilizing them in your own essays, and you are creating organized essays because you are using transitions and brainstorming before you start composing your essay. While the improvement in vocabulary and organization will absolutely make a huge difference in terms of your overall score, you know that in order to maximize your potential points earned on the writing section, you need to improve one other fundamental aspect of your writing: grammar. To get the highest score on the TOEFL writing, you know that you need to eliminate or at least minimize grammar mistakes. But where should you begin? You've probably been studying formal grammar rules in school for years, so how do you know what particular points to focus on when your TOEFL test date is on the horizon? If you only have time to brush up on one grammar topic, make sure that you make it sentence fragments. Is it possible that some grammar errors are more serious problems than others, even on the TOEFL? Notice how ETS phrases how grammar and vocabulary issues are taken into account. To achieve a 4 or 5, you may only have "minor lexical or grammatical errors" that do not "interfere with meaning." Furthermore, the human essay scorers read tons of essays every day, and at many test grading centers, scorers are encouraged to spend about 2-3 minutes per essay in order to keep up with the number of essays submitted. A very slight issue might not matter enough to warrant decreasing your score or it might be so minor that it gets missed because the grading process necessitates going through the essays so quickly. Even after test day, some native speakers reading your work may overlook some smaller mistakes, especially if they can still understand the meaning. In fact, some native speakers might not even realize that a grammar error has occurred as they may not be clear on what the grammar rule actually is for certain topics. Generally speaking, Americans are not instructed in grammar topics beyond elementary school, and the importance of good grammar frequently gets downplayed in formal school settings. As a result, many may not even be aware of the complexities and minutia of many grammar rules. But one grammar issue that cannot be easily overlooked is the sentence fragment. A sentence fragment is difficult for native speakers to ignore because it interrupts the normal flow of reading. Even those who do not consider themselves grammar experts can spot fragments because as they read, something feels missing; things are incomplete. In other words, sentence fragments are one of the most noticeable and recognizable grammar mistakes on the TOEFL and in writing situations after test day, so learning about them now will yield short and long term benefits. One final benefit of making sentence fragments your grammar priority is that they are found on standardized tests beyond just the TOEFL. If you are studying for the TOEFL, you may also need to take other admissions tests like the SAT. Sentence fragments are common sentence errors that appear on the new SAT in the Writing and Language section, so by eliminating this issue from your own essay writing, you will be able to do so on the multiple choice section of the SAT and in the optional SAT essay. One of the top errors to look for, the run-on sentence, is essentially the exact opposite of the sentence fragment, so by getting a better understanding of the fragment, you will also get a better grasp on how to fix run-ons as well. In order to know what a sentence fragment is (and how to prevent these types of errors in your own writing), we need to know what makes up a sentence. A full sentence is an independent clause. You should check that you can clearly identify the subject and the verb of each sentence that you write. This will also allow you to check that your subject and verb agree, which is a good habit to get into (especially because this is another frequently tested grammar error). If you don't have a subject or a verb, you cannot have a complete sentence. Also be sure to confirm that the verb in the sentence is actually acting as the predicate in the context of the sentence. Writing, proofreading, and note taking are all essential academic skills. Correct. In the example above, the be verb are is the verb and begins the complete predicate even though you may at first be drawn to the words writing, proofreading, and note taking as they are actions that you can see. In this example, however, they act as the subject. If you know that you have both a subject and a verb in the form of a predicate, ask yourself if you have a complete idea. In other words, have you given the reader all the information that they need to know in order to avoid confusion? This lack of information may occur if you did not provide an object but the verb must take an object (as it is a transitive verb). When working with a subordinating conjunction, you will need a separate independent clause (full sentence, meaning a subject, verb, and complete idea). If your subordinating conjunction begins the sentence, you will need a comma before your independent clause. Using subordinating conjunctions allows us to add sentence variety and often complex ideas to our writing. By understanding the rules for subordinating conjunctions and complete sentences, readers will be able to understand and appreciate all of our ideas. So, by confirming that you have a subject, a predicate, and you've expressed a complete idea, you can be sure that you have a full sentence and not just a fragment-- a portion of a sentence masquerading as a full sentence. My favorite grammar website, bar none, is NoRedInk.com. I have used this website with native and non-native speakers alike, and I cannot speak highly enough of this excellent resource. Because of the way that the site is set up, you are able to select particular topics. Although subject-verb agreement, verb tense, and comma rules are all also excellent topics to review and NoRedInk makes grammar practice as painless as possible by crafting example sentences based on your own self-selected interests, if you are pressed for time, begin with the unit on sentence fragments. By locating and fixing sentence fragments in the given sentences, you'll be able to apply the same concepts to your own writing, where it is often more difficult to find sentence errors. Once you feel comfortable, go through old essays and see if you can locate sentence fragments. If you locate any, fix them. Once you think you've taken care of them all, upload your essay to Grammarly (this is an affiliate link. If you want to read more about why I am a huge fan of Grammarly, check out my post about it here). Grammarly will catch any sentence fragments you may still have and recommend ways to fix your sentence. For this reason, it can be an excellent learning tool. Get into the habit of writing new essays within the time constraint, leaving two minutes at the end to proofread and edit your work. As I recommended in the pacing guide I wrote for WeAreTeacherFinder.com, don't practice writing right up til the last second; give yourself time to catch those grammatical errors, particularly sentence fragments, in order to get the highest score. Not sure what topics to write new independent essays about? Grab 30 days of writing prompts in the free One Month TOEFL Writing Challenge Printable. Thank you! 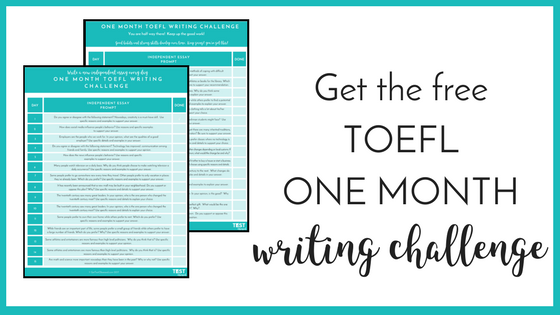 Click here for your free One Month TOEFL Writing Challenge Printable. As always, be sure to check your email for even more TOEFL tips. When hearing the word body, most people immediately imagine exercise, sculpted abs, or getting in bathing-suit ready shape. As an educator who has taught writing at both the high school and college levels, my mind jumps to something very different: body paragraphs. While the paragraphs that follow the introduction segment of an essay might not at first seem to have much in common with fitness, both types of bodies are at their peak when planned out and when following a particular regiment. In other words, planning and structure are critical for building solid, powerful body paragraphs. So what shape should body paragraphs take? Here are the 6 parts every body paragraph needs to have. Besides the thesis statement, topic sentences are the most important sentences that you will write. You know that those who grade essays on standardized tests do not have very long to spend with each essay, and as a result, it is even more important to make sure that the reader is clearly guided through the essay. The topic sentences states the main idea of that body paragraph, and as a result, it should reflect some part of the thesis. Your second sentence gives you the opportunity to restate the idea from the topic sentence, showcasing your paraphrasing ability, and allows you to get a little deeper, clearing up any terms that need to be defined (especially big abstract nouns like freedom or success that may be very subjective) or getting more specific. This should set the reader up for sentence 3. Now you are ready to dig into your main reason or support. This idea can make up the bulk of your body paragraph, but it should be spread over multiple sentences as to avoid creating a run-on sentence. You can reference an article you read recently on the topic that has lead you to take this position or you can talk about a personal situation that has informed your opinion. You may find as you practice that you are frequently reusing the same material in a number of essays and that's okay as ETS doesn't know that; as long as your versatile example seems appropriate for the question presented on test day., feel free to use the same ideas you've used in prior practice essays or modify those ideas so they seem to fit perfectly (even if that means slightly exaggerating). If after adding your main reason or example, your paragraph is now at least five sentences long, you can move on to your wrap up sentence and then move on to your next body paragraph. If not, continue to add to that paragraph with the next step. If necessary, smoothly transition to introduce another, secondary, reason or example. Gain trust with your reader and add to your word count by adding another similar piece of support for the main idea featured in your topic sentence. If you used a more academic reference use a personal one. This will round out your answer, making it seem more thought out. It is necessary to include the proper transition so the reader understands how this is connected to the first example given. Provide the second reason or example, if needed. Just as you did with the first supporting reason or example, explain fully how this supports your main claim in the topic sentence. Remind the reader how this reason/example ties back to the position stated at the top of the body paragraph. Especially if you've got more than one reason or example, it is imperative that you reiterate how these points illustrate your main idea. Don't use the same exact language because you do not want to sound redundant. Body paragraphs are where the bulk of development happens inside an essay. As a result, using transitions, clear reasoning, and supporting details are crucial. By following this pattern, your essay will stay well sculpted time and time again. Get tons of body paragraph practice when you download the free One Month Writing Challenge printable. Perfect your strategy by writing 90 body paragraphs for the over two dozen practice independent essay questions in this download. I want 30 FREE TOEFL Essay Questions! Thank you! Now that you know how to create perfect body paragraphs, put this structure into practice with 30 independent essay questions. In the spirit of full disclosure, I am a Grammarly affiliate, which means that I may receive a commission if you decide to purchase anything from Grammarly using my link. I recommend Grammarly because I use their services myself, and I regard their product highly. Posting on Facebook. Updating Twitter. Emailing your professor or boss. We write so much every day that we often don't even realize it...until we start thinking about if every day should be one word or two words. Did you send that email using the wrong form of there/their/they're or misspell tries as trys in the presentation that you just made in front of the class? When we make grammar mistakes, we can look unprofessional, but for so many people, grammar is just tough. There are many rules to learn, and English grammar rules have tons of exceptions. You can't master English grammar overnight, but you can prevent many of those red ink marks before submitting your paper to your professor. Grammarly is a plug-in that can be added directly to your web browser (like Google Chrome or Safari). That means when you are typing in your web browser (like when you are composing an email), Grammarly can read and check for over 200 different grammar errors. It can integrate with Microsoft word if that is your preferred word document composing tool. In other words, Grammarly can check many different types of written language for many common mistakes. You might be thinking about the built-in tools in programs like Word that you've used in the past. Even after fixing those errors, you may still have had your professor return your paper will many corrections. Grammarly is far more powerful and understands the context of the words better than other similar spelling/error detection. Grammarly doesn't just check that a word is spelled correctly; it makes sure that you have selected the right word, too. But it isn't just because Grammarly is more thorough that I prefer it. Grammarly is also a good teacher. Any time that Grammarly believes it has detected an error, it not only alerts you to the error and its suggestion but it also tells you what the error is and explains the rule. Each time the software makes a suggestion, it gives you the option to expand the card to read why. I love this aspect of the software. In this way, Grammarly is preventing you from making mistakes now and in the future. If you start to notice a pattern, such as a constant issue with commas, you can review the rules for commas and sentence structure. Just like a teacher or a tutor would, Grammarly is essentially telling you what area of English grammar to focus on. Because grammar is such a big topic, this side benefit is hugely advantageous. That is why I wasn't surprised at all to learn that 85% of their users feel they are now stronger writers and nearly 99% reported improved writing grades. Grammarly actually grades your writing in real-time using a scale out of 100 that can be found in the bottom right-hand corner next to the number of critical and advanced issues detected in the document. If you click on the score, you can access a detailed breakdown of your writing. This feature can serve students and teachers alike. The number itself is great motivation to spend additional time making revisions to increase your score while the easy-to-implement recommendations can be incorporated with a quick click of a button to make the change. This editing tool can suggest vocabulary words that will enhance your essay or make stylistic recommendations. Whether you are an English language learner or consider yourself an English expert, Grammarly has something special to offer. For those who want an extra set of eyes to look over work before hitting publish or submit, sign up for a forever-free Grammarly account. If you think you need additional support or want to access the more advanced features, take advantage of Grammarly Premium's extremely affordable monthly subscription plan. At less than $12 per month for unlimited proofreading, editing, and plagiarism detection, Grammarly is far cheaper than a tutor and frequently far more thorough. Take your writing to the next level with Grammarly.